So, if you are going to return north from a week in Florida, in January, you might as well dive head first into the coldest and snowiest days all winter, to make sure you will absolutely and thoroughly miss where you’ve just been. Instead of driving to the day-job, I stayed home and plowed snow drifts yesterday. It is hard to tell how much snow fell around here, because the depth ranges from about an inch in some places, to two feet in others. I took a picture with Delilah in it, but I was focused on showing the fine pathway I cleared around the back pasture fence line. 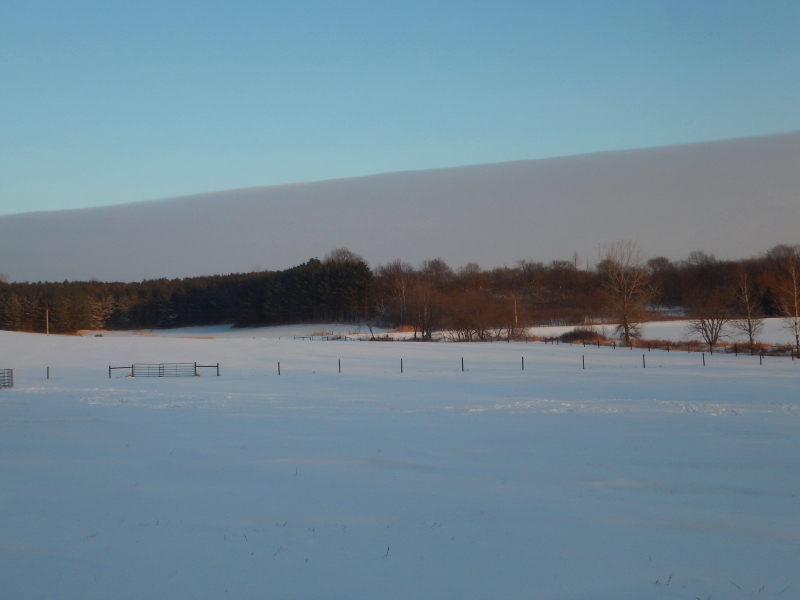 Then I noticed that interesting cloud bank in the sky. That was some pretty distinct delineation of cloud and clear sky right there. Nature sure makes cool stuff. 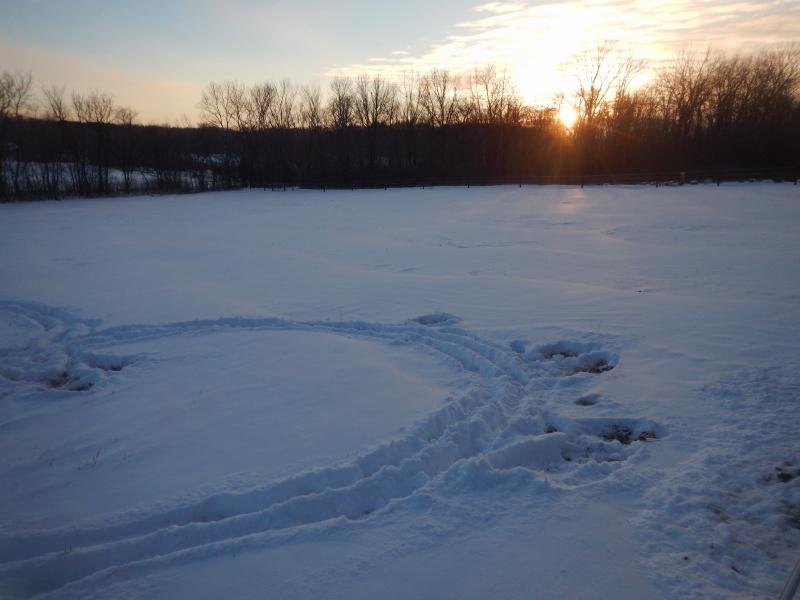 As Delilah and I walked the path around the pasture, I noticed the horses had made cute little circle tracks in the fresh snow, leaving little visible spots of where they foraged grass to graze. It almost looks like they were on cross-country skis, as they moseyed along. Speaking of tracks in the snow, as Delilah and I started our walk from the house, breaking trail in the new snow, we came to the spot where our trail cam captured a view of the fox last year. Something had just entered our property there within the hours since this overnight snowfall. 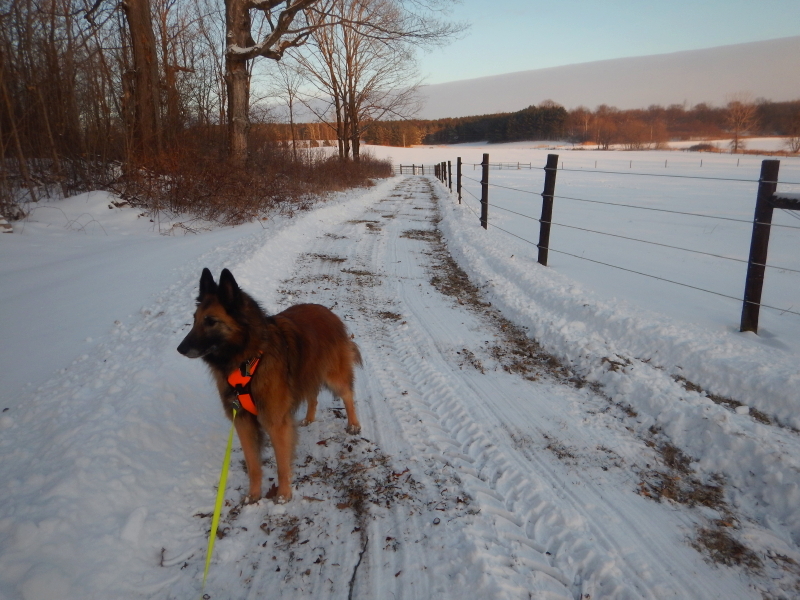 I decided to let Delilah follow the trail into the neighbor’s woods, in case we might find where the fox has a den. She was thrilled to have been granted access to this forbidden land and leaped through the snow to explore where the tracks led. Well, even though it had been less than twelve hours since the majority of the snow fell, there were already a dizzying web of trails crisscrossing the wooded slopes. The snow was fresh and just deep enough that identification was difficult, but there were so many different pathways that I soon realized the chance we were following one fox had become very unlikely. We reached a spot where tracks were everywhere, and the leaves beneath the snow were turned up in a wide variety of places. For a second, I wondered if it was a pack of coyotes, but then I deduced it was much more likely to be a flock of turkeys. No wonder Delilah was so excited over that particular location. I convinced her to reroute our exploration back toward our property and gave up on hunting for a fox den. At least we finally have a snow cover that offers better footing than the icy glazing we had battled the previous month. I enjoyed reading your reflections here, John: did you know that it was from reading trails that reading as we know it probably evolved. Certainly, that knowledge might inspire the new generation to be avid readers – of signs that speak of eternity. It is something that fascinates me out in Nature and also as part of the written word, for as they say, in the beginning was the word – a configuration of signs. We seek to know what they mean and feel alive projecting our everything into the analysis. Funnily enough your Words on Images do seem at times like portals to some, otherwise, unfathomed depths. Yes, on the one hand, an amazing, startling picture of immanence and, on the other, something transcending, lending some sort of direction to our existence, both past and future oriented. Indeed, time stands still, and yet it doesn’t, ‘we’ (or our construction of ‘we’) being a part of the process. Yes! This is one way to explain how some of the words and phrases arrive in my mind. A portal of time, past and future. Often, the words don’t make sense to me, but I use them as they come, trusting beyond my limited perception and going with the flow.